Cognitive Behavioral Therapy or CBT for LGBTQIA+ clients in Rehab. 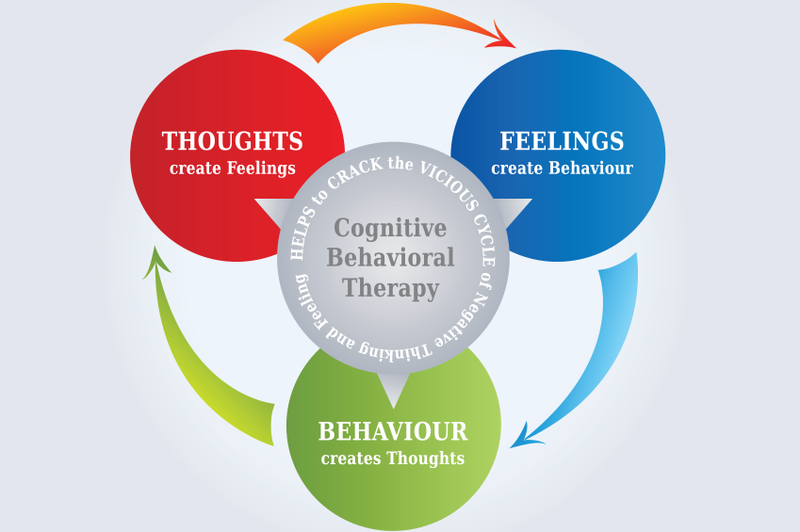 Cognitive Behavioral Therapy (CBT) is a researched and evidence-based form of psychotherapy originally created to treat mental disorders, including anxiety and depression. It has been found to have a wide range of applications in the mental health arena, including treatment for substance abuse and alcoholism. CBT is based in present-day circumstances and aims to find practical approaches to problem-solving—whereas other types of therapies, such as Freudian psychoanalysis, dig into memories to uncover significant childhood experiences that can be considered the root causes of mental illnesses. In CBT, current conditions are examined, promoting awareness of current distorted thinking patterns that are detrimental. CBT suggests that a person’s thoughts, emotions and behaviors all affect one another. For example, having a thought of something troubling may lead someone to feel the emotion of depression, which can lead to the behavior of self-medicating with drugs or alcohol. The negative behavior will reinforce negative thoughts or perceptions one has about themselves which then reinforces the emotional state of depression. This promotes more negative behavior. This cycle can repeat over and over and thoughts, emotions and behaviors can become more “automatic,” and less logically controlled. In Cognitive Behavioral Therapy, clients are asked to notice their patterns of automatic thoughts and beliefs and how these things are affecting their lives. Once awareness of these thoughts is achieved they can be challenged and re-worked into something different. In this way, one can begin to change how they feel by changing the way they think, which may lead to more healthy behavior and, in turn, reinforce the new ways of thinking and feeling. Typically, CBT will initially begin by taking a look at the way someone thinks and making an attempt to change it, but a negative cycle of thought, feeling, and behavior can also be disrupted by intervening at the behavioral level. For example, exercising may help people to think and feel better about themselves. However, CBT recognizes the power of thought alone to change how someone feels. The power of thought is easily qualified. Imagine walking down the street and suddenly a recent embarrassing situation comes to mind. The feeling of embarrassment will be experienced again. The feeling was triggered by the thought. If the thought can be changed the emotion triggered by it may be different. Becoming aware of things, such as the example above, and noticing one’s own distorted thinking and self-defeating beliefs won’t necessarily stop irrational thoughts from happening. This is why therapists using CBT will help clients employ methods and strategies to disrupt and deconstruct the negative beliefs and patterns of thinking they have. These strategies can involve practicing new behaviors such as identifying cognitive distortions, thought stopping, cognitive restructuring, reframing, and systematic desensitization. Other techniques used in CBT include calm breathing and relaxation techniques, role-playing, and other methods of challenging negative self-talk and harmful thoughts when they arise. Since addiction, in particular, can become so entrenched in behavior to the point where thoughts and feelings become clouded and behavior can become extremely automatic and impulsive, Cognitive Behavioral Therapy techniques have proved useful for treating substance abuse disorders and alcoholism. CBT is utilized in many addiction treatment centers across the country. Cognitive Behavioral Therapy is one of the many effective techniques our therapists use to address addiction and alcoholism with clients at Inspire Recovery. Our qualified team of mental health professionals is well versed in these methods and implement them in ways that best serve the healing process. The therapists at Inspire Recovery are committed to treating the disease of addiction. The Inspire program includes CBT in our group and individual sessions as a means to improve the quality of life of those we serve. It is important to keep in mind that therapy and counseling are joint efforts between therapists and their patients. The more the clients actively participate in their therapy, the more effective the therapy will be. For this reason, it is part of the Inspire Recovery vision to provide a safe and comfortable atmosphere where it will be easy for clients to open up.